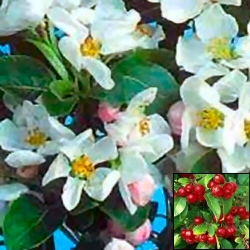 Our Red Sentinel Crab apple has scented white flowers in the Spring that go on to provide stunning cherry-red crab apples that stay on the tree well into January providing a good source of food for birds or can be cut for Christmas decorations. Expect the blooms around April but as with train time tables it depends where you are that dictate accuracy. The further North you are the later the blooms will be by up to a month. Like other crab apples, Red Sentinel is a small tree, with a final height of 5m (16ft 8in) and is tolerant of pollution, so ideal for small, town gardens where car fumes or industrial pollution is an issue. Being a bit of good looking tree it has won the RHS award of garden merit and is suitable for planting in public spaces because it is long lived and robust (this does not mean over weight!). The Red Sentinel Crab apple will benefit from an occasional thinning to encourage new replacement growth. You could train against a wall as the Red Sentinel is well suited for that or grow in a pot however, depending on the size of the pot this may have a dwarfing effect. Another bonus to the Red Sentinel is that it is tolerant of clay soils. This tree is supplied at of height of between 1.5m and 1.7m and in a 12 litre container, which means that the tree can be planted any time of the year and with better results than either bare-root or rootballed trees.